Kevin Maher is a busy man. In addition to his professional duties as a producer for Comedy Central and freelance writer for IFC, Maher is a full-time husband and father of two boys. Even still, he manages to eek out just enough time to “geek out” on pop culture topics at Nitehawk Cinema once a month. His event, “Kevin Geeks Out“, offers a deep dive into a particular topic by inviting guest speakers, sharing film and TV clips, and producing multimedia presentations. This coming Thursday, September 17 at 9:30 pm he’s taking on the light-hearted topic of the end of the world: the Apocalypse. It will be his fourth show at Nitehawk (136 Metropolitan Ave.) in as many months. 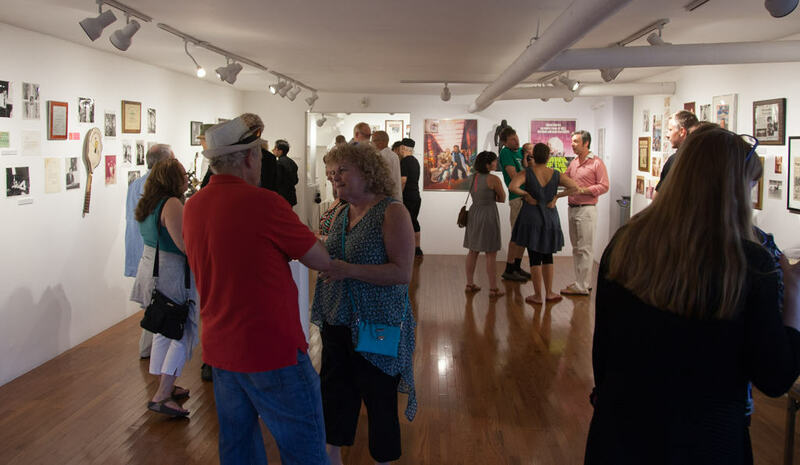 Opening night of “HYPE” at the Janet Kurnatowski Gallery c/o Matt G.
Last Saturday, the Janet Kurnatowski Gallery opened its last show—HYPE—a look at the life and work of the legendary press agent Billy “Silver Dollar” Baxter. The show is a collection of writings, photos, videos and vintage audio recordings that Baxter was part of during the peak of his career in show business in the ‘60s and ‘70s. 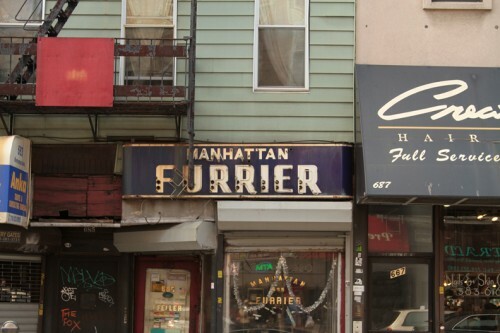 The Manhattan Furrier sign on Manhattan Ave.
To anyone who lived in Greenpoint prior to 2012, the Manhattan Furrier was a fixture along Manhattan Ave. for many years (it is now occupied by the Vietnamese restaurant Lollipop). The proprietor, Irving Feller, was also a prolific painter and used the back of his storefront as a studio where he would stretch canvases and render his various works. 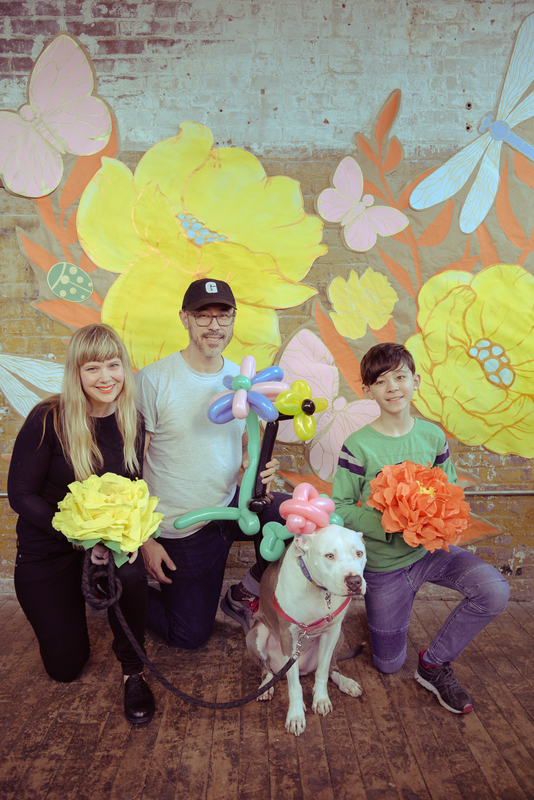 Greenpoint resident Jenn Nielsen has been working on a documentary film about Irving and his art and they are now in the process of completing funding for the film via kickstarter. You can also see a trailer for the film. 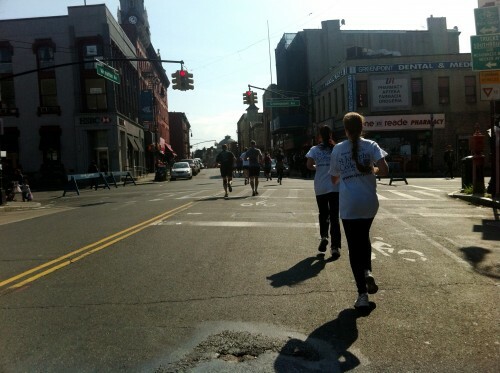 The Get To The 'Point 5K Run crossing Greenpoint Ave. along Manhattan Ave. Web series have taken off in the last few years as a new medium that gives artists a viable way to make content. One new series, PSYCHODRAMA, has just launched over the summer,using the picturesque backdrop of our neighborhood. 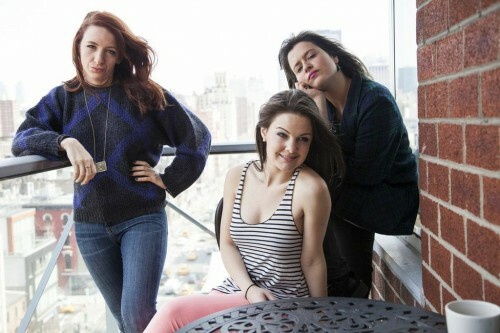 I recently had the pleasure of sitting down with the three young ladies (Luisa Fidalgo, Liza Renzulli, and Kimmy Foskett), who created and star in the series, to discuss their experience with inspiration, crowdfunding, and, of course, shooting in Greenpoint. Tuesday morning en route to the Nassau Ave. G train, I was surprised to encounter a large tree branch laying across Norman Ave. while resting partially on top of a guilty-looking Pepsi truck. It appeared, upon closer examination, that the tree had just been clipped by the truck, which caused some of the wood to split, taking down a large chunk of the tree with it. Traffic was closed on the street as a result of this significant obstruction. 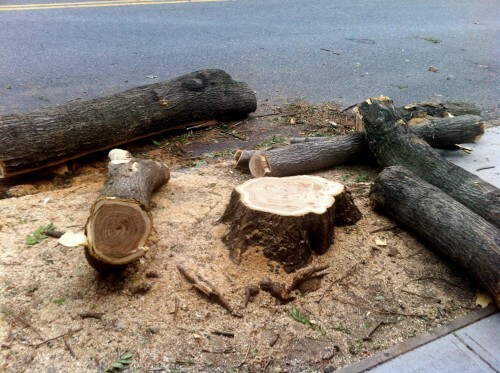 However, as of that evening, the entire tree had been cut down and almost entirely removed. 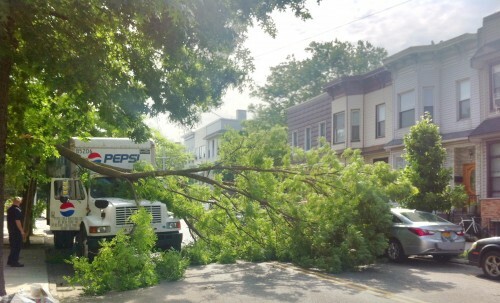 It’s a shame considering that it was a good tree that just got hit with some bad luck (or, in this case, a Pepsi truck). An innocent casualty in the transport of carbonated beverages, the city had no choice but to take it out it entirely. Don’t you agree that Pepsi corporation should pay to replace it? 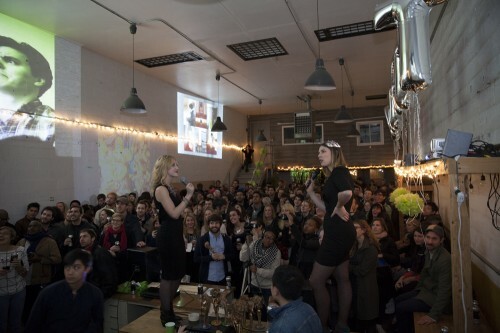 Let’s keep our Greenpoint green! 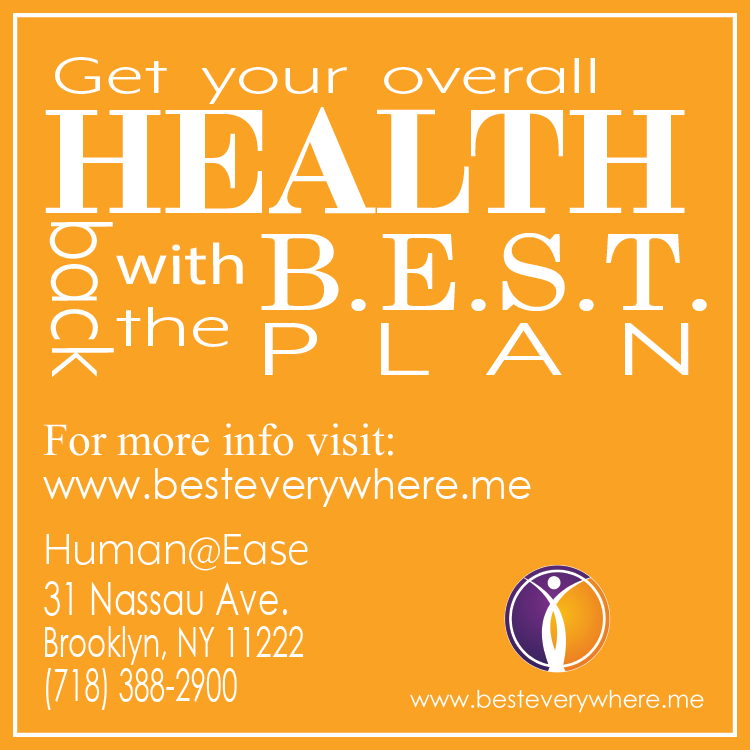 On this rainy day, rather than trudging around on the subway, don’t you wish you could work from home? Or at least at the local cafe? If you do or plan to in the near future, here is a guide to Greenpoint’s Best “Work From Home” Cafés. 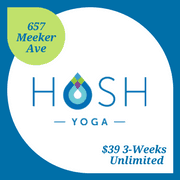 Greenpoint is a veritable hotbed of freelancers and work-from-home individuals who often look for places to get work done outside of the home. 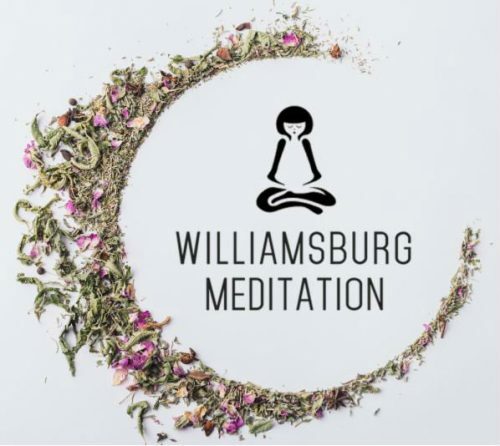 While there are now many different offerings and alternatives to our neighborhood Starbucks, we thought it was high time to acknowledge the best places to work from home away from home in Greenpoint. 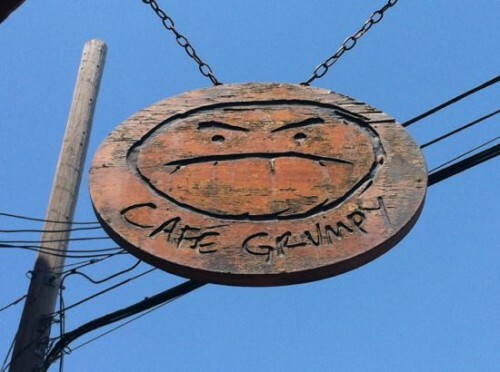 Grumpy has been around for nearly ten years and is the go-to coffeehouse for writers and freelancers. Subscribing to the “no-frills” philosophy, Grumpy does not offer much in the way of food or exotic pastries but it covers the basics with coffee and tea drinks and your essential scones and muffins. A hub of bustling creative activity, Grumpy is always near capacity when I’ve dropped in. Interestingly, Grumpy also roasts their own coffee beans in the back of the shop which adds an aromatic perk to the experience. As expected, there is free Wi-Fi at Cafe Grumpy and the signal is strong throughout. Certainly, there’s something to be said about the “experience” of getting work done at Cafe Grumpy – it may not always be conducive to distraction-free working, but the energy therein is certainly palpable. And as Grumpy’s burgeoning trendiness (thanks GIRLS) may now soon extend to the likes of Times Square, it’s recommended you try the original, Greenpoint-flavored original. And in yet another proverbial “nail in the coffin” on video rental stores, the local mainstay “Video Random” located on Norman Ave (off of Newel St.) is finally closing its doors. The owners, who have always catered to both domestic US tastes as well as those of the neighborhood’s Polish citizens, cite the usual factors in their decision to close up shop such as Netflix and online video streaming services to the failing video rental business model. Currently, there’s no word as to what business will take the place of Video Random, but you can currently pick up any of their second hand DVD’s for $2 each and their previously rented blu-rays for only $5. In case you were wondering, their copies of “The Godfather” and Brian DePalma’s “Scarface” were the first movies to go. But on the plus side, you can still pick up that copy of “Beverly Hill’s Chihuaha” on blu-ray that you’ve been meaning to acquire. The owners were unsure of how long their doors would remain open, but they estimated they would still be there for at least two weeks. We see them everywhere: on our streets, in our parks and sometimes in our bars and restaurants. Film shoots are a guaranteed daily encounter on the streets of Greenpoint. And while the scale and size of these productions vary from multi-million to zero, one thing is for sure: Greenpoint gets a lot of moviemaking love!